Well it works for a pirate smuggler. The pose could be better. Standing straight does not work for this miniature. Even just a little movement in the pose would have helped it a lot. Good neutral pose, if a just a little "too neutral". Paint seems well done, but so bland I can't stare at it. 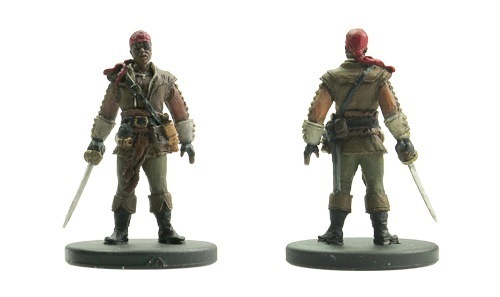 Still, the best pirate of all pre-painted sets. This is a quite good sculpt (beside the hands, and perhaps you could argue that the pose is kind of stale). Good details for a prepaint. The paintjob is however abit singular with not that many contrasts which gives it a bland impression. Anyone know what book the art for this mini was based on? Thanks, that makes sense. I combed through Skull and Shackles, and the NPC Codex. Thanks from me too. Continuing in the same vein where is the Pirate Sailor (same set) artwork from? That's also from Isles of the Shackles. It's the Besmaran Priest on page 43.